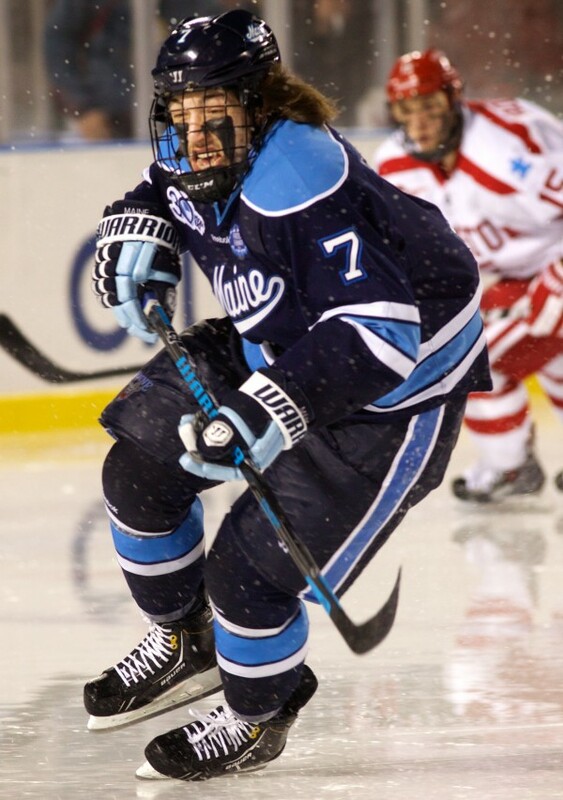 Suspended University of Maine hockey player Ryan Lomberg skates through wet spray on the ice at Fenway Park in Boston in this picture. BANGOR, Maine — A suspended University of Maine hockey player is expected to plead guilty Monday at the Penobscot County Judicial Center to a disorderly conduct charge in a plea agreement with the district attorney’s office. Ryan Lomberg, 19, of Richmond Hill, Ontario, is not expected to appear in court. His attorney, Peter Cyr of Portland is expected to enter the plea in connection with an April 26 off campus incident on Lomberg’s behalf. Lomberg was scheduled Aug. 4 to appear in court in Bangor. That hearing was continued until Monday, according to the Penobscot County district attorney’s office. Orono police began an investigation that led to Lomberg being charged with disorderly conduct and assault after a man came to the station April 27 and reported he had been in an altercation with Lomberg the evening of April 26 at a Summer Street residence, Orono Police Chief Josh Ewing said in May. Ewing said the alleged altercation between Lomberg and the victim began over a previous dispute about a dog that belonged to a mutual acquaintance. Ewing told the Bangor Daily News that Lomberg allegedly knocked the man to the floor and kicked him in the face and midsection before he was pulled off the victim. He added that the man suffered a broken nose and concussion before he went to Eastern Maine Medical Center on his own. In exchange for his guilty plea to the Class E crime, a Class D assault charge will be dismissed, according to Brendan Trainor, assistant district attorney for Penobscot County. Lomberg will pay a $1,000 fine. He has paid $252.62 in restitution to pay the victim’s medical expenses not covered by insurance. He was suspended from the team and other UMaine activities in May after the charges were filed. Rich McKenna, assistant general manager of the Muskegon (Michigan) Lumberjacks of the United States Hockey League, said last month they have traded Lomberg’s rights to fellow USHL team the Lincoln (Nebraska) Stars. The trade indicated Lomberg is contemplating leaving the UMaine program or could be permanently removed from the team, so he is looking for a place to play next season, according to a previously published report. Lomberg is not listed on the 2014-15 UMaine roster on the institution’s athletic website. If he transfers to another Division I team, he would need to sit out one year, as mandated by NCAA transfer rules. After one year in the USHL, which is a Junior-A amateur league, he could still play college hockey. Lomberg faced up to six months in jail and a fine of up to $1,000 on the disorderly conduct charge. On the assault charge, he faced up to a year in jail and a fine of up to $2,000. BDN writer Larry Mahoney contributed to this report. Correction: A previous version of this story reported that Lomberg had pleaded guilty to charges against him. He has not yet pleaded guilty, but is expected to.